The Undergraduate Council’s election period for president and vice president officially opened on Monday. Like all other election seasons, this time calls for reflection on the past year and critical evaluation of what can be improved in the year to come. Which people should occupy these positions should be incumbent upon whether their election promises to affect these changes. One of the largest issues plaguing the UC and presidential campaigns is a lack of accountability. Year after year, candidates offer programs or push for initiatives that do not come to fruition. Pledges to complete certain improvements or to communicate progress to the student body continuously fall short. There is little done to ensure that candidates are held liable for the plans they lay out in their campaigns. The next UC president and vice president should place precedence on being transparent in their inner workings as well as communicating effectively with the student body. Accountability is crucial in sparking change; we encourage the UC to make tangible efforts to be more accountable to their fellow students and actually create goals that are reachable. 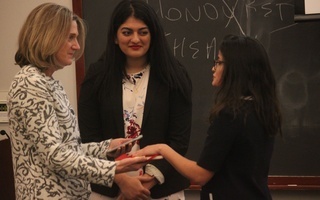 Given that, we believe that the two tickets that bring UC experience — Sruthi Palaniapppan ’20 with running mate Julia M. Huesa ’20 and Nadine M. Khoury ’20 running alongside Arnav Agrawal ’20 — are very similar, and we see positive aspects in each. While both of their particular experiences within the UC will be especially valuable in improving how the UC operates internally, we believe that the Palaniappan-Huesa ticket presents the most attainable goals. In the long run, we believe that making the greatest impact on the student body today is of primary importance. Palaniappan and Huesa aim to do so in their prioritization of the first-generation faculty mentorship program and in their emphasis on communication. Specifically, they plan to communicate with the student body by way of videos and by keeping in conversation with many cultural and identity groups on campus. We endorse the Palaniappan-Huesa ticket because we believe they make the most realistic promises and have goals that are more likely to take shape in the undergraduate community. Regardless of how the elections results turn out, all of the candidates echo one another in their platforms, underscoring the pressing need for many changes to occur. For example, the ticket of Daniel K. Ragheb ’20 and running mate Samyra C. Miller ’21, like the Palaniappan-Huesa ticket, places crucial import on spearheading sexual assault and mental health reforms, and, similar to the Khoury-Agrawal ticket, focuses on improving social spaces. These are real and urgent issues across campus that evidently require addressing. All tickets should take a careful look at their peers’ proposals and attempt to incorporate the spirit of those ideas into their objectives as president and vice-president. Ultimately, we hope that the winning ticket will not only work to achieve their vision for the College, but also prioritize designing accountability mechanisms, and following through on their implementation, to keep the student body informed of their progress. A recent piece by The Crimson Editorial Board criticizing the outgoing leadership of the Undergraduate Council — of which I am the former Vice President — represents a failure of adequate research.